How far would you go to save your son? Especially when he's dumb enough to pick up a package of 7000 pills of Ecstasy his best friend sends to him? If it were up to this writer, the could rot in jail forever, and the world would be a smarter place for it. 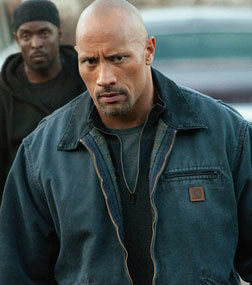 Ric Roman Wagh, however, decided to give us a seeeerious action movie with a message starring Dwayne Johnson. And the message is - Drug dealers should not get longer sentences than rapists and murderers. Well, we might say that the boy, Jason Collins (Rafi Gavron) was put in prison for criminal asininity rather than criminal substance abuse. 'Coz, you see, Jason got screwed over by his bestie who used to "hook him up" (this bit of vernacular, which sounds like it has something to do with dating, apparently implies an introduction to drug dealers). The friend sent over the aforementioned package even though Jason refused to take it, got caught, got put in prison, and snitched on Jason to cut down his own sentence. Jason, who is facing a minimum of 10 years in jail, has only one option - join hands with Federal agents and play snitch on someone else. "What? Snitch on someone? Like my 'best friend' did with me?!?" says an indignant and handcuffed Jason. And now his estranged daddy dearest, John Matthews (Dwayne Johnson), must find someone else to snitch on because his son refuses to do the snitching. How exactly did these guys come up with the title again? What happens next is that John talks a lot - to his ex-wife, to his son, to some poor guy he managed to bribe into helping hm out, to Federal agents, to drug cartel kingpins... phew!, and does very little shooting, all of which seems to be making no impact on an audience that was there for good 'ol fashioned yippee ki yay in the first place. John seems to have talked us all into a wakeful coma, wherein not even bloody body parts flying here and there could arouse is us the excitement that was promised in the trailers. Johnson, instead of flexing those WWF championship-winning muscles, chooses to stuff them into really tight shirts and toned-down trousers, and give us a suburban middle aged daddy routine instead. And boy, you should see him emoting - it's like watching cracks emerging on a rock, or should we say, The Rock. That is not to say that the acting is bad, exactly. All the actors, those in leading roles as well as those playing supporting characters, actually do a commendable job considering how badly they presumably wanted to laugh while mouthing the utterly ridiculous lines. The background score skips its intention of ominousness, and strikes omnipresently annoying, instead. The mysteriously dingy camerawork does nothing to salvage the whole thing. All in all, if blood and gore is what you're looking, head for that other gore fest in town - Die Hard V.
Be the first to comment on Snitch! Just use the simple form below. fullhyd.com has 700,000+ monthly visits. Tell Hyderabad what you feel about Snitch!